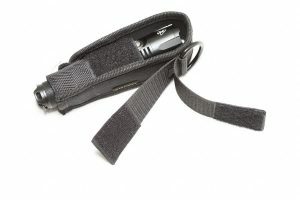 Since I was going to make a list of the best Tactical Flashlights currently available, I wanted to buy one of the best tactical flashlights currently on the market. I bought my copy on Aliexpress, but it looks like I received the Chinese version packaging instead of the English version. Fortunately the manual is still in English. The parcel was a little damaged, and I received the cool white version. 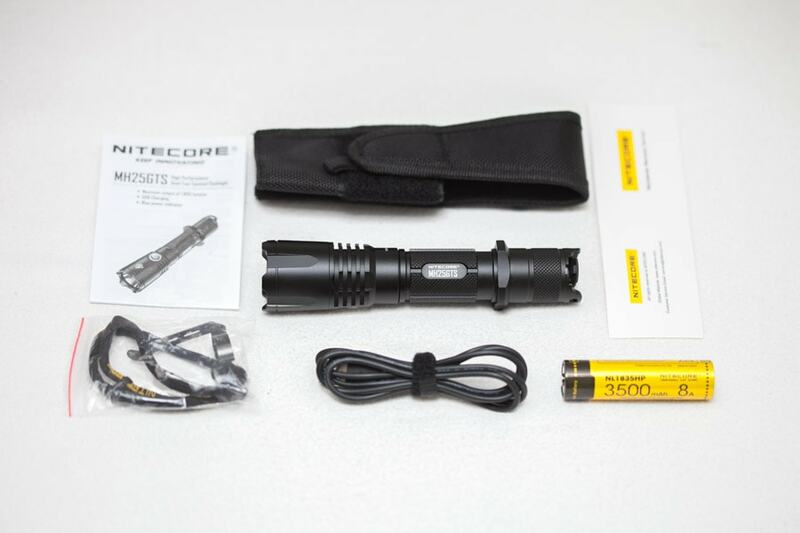 Compared to the Jetbeam TH20 I reviewed earlier, the Nitecore MH25GTS is quite a bit smaller, about the size of the old Sunwayman V20C. I will show some comparison pictures below. It's still rather a long flashlight compared to my other 18650 flashlights. 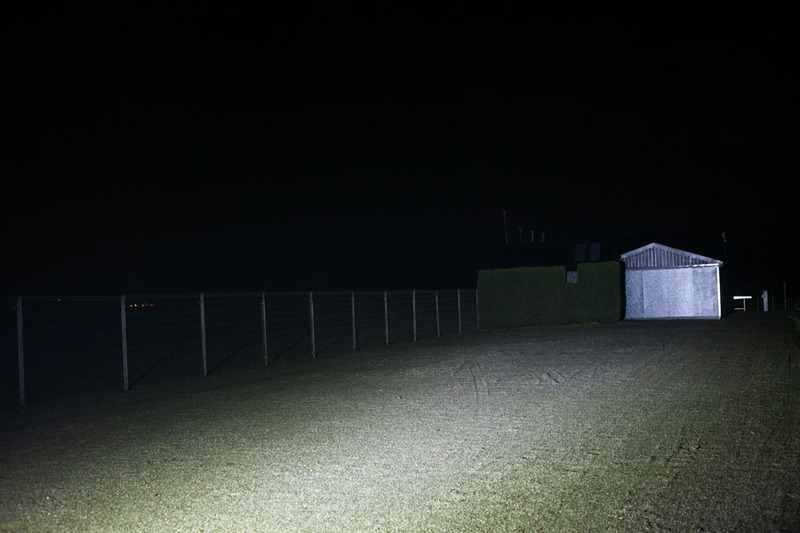 These days manufacturers tend to make shorter and shorter flashlights, but this it sill quite long. 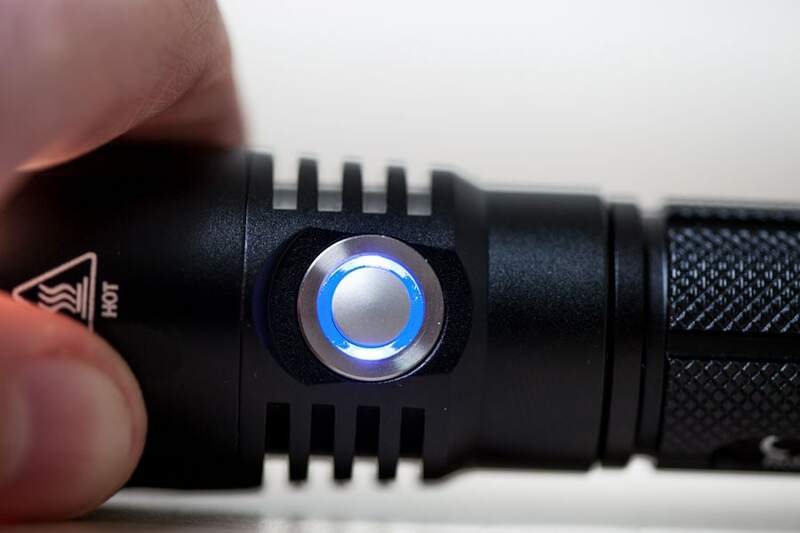 The mechanic tailcap switch is a forward clicky (like all tactical flashlights should have) and besides the button you can find the USB port for the built-in charge function. The switch isn't sticking out as much as the Jetbeam TH20 which makes it more difficult to use with gloves. The first time I tried to insert the MH25GTS into the holster it felt like it didn't go any deeper, so I took of the pistol-grip ring, but then it went too deep. So I tried it again with the pistol grip ring attached, and pushed a little harder.. then it worked. But when I did that, I cut the thread that attaches the velcro part to the holster.. I don't think it was supposed to do that. So that was way too weak! At the moment it happened it felt like it was a magnet attaching both ends.. but it wasn't I snapped the string that kept both sides together. See the picture below for more clarification. The middle flap should be attached to the holster?? Yes, but not very stable!!! I don't recommend using it tail-standing. 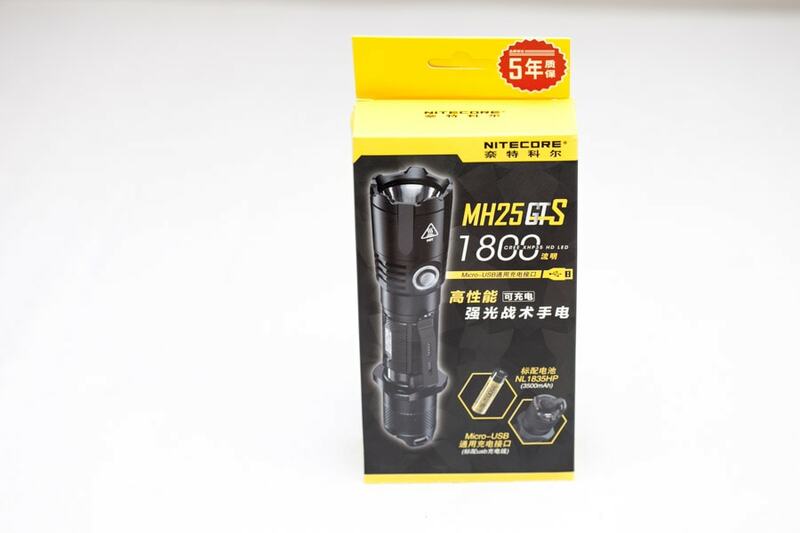 Anodization is the coating of a flashlight, and the MG25GTS has a proper coating all over the flashlight. No color variations or missed spots. The build quality is great. Unfortunately though, the parts of the flashlights seem to be glued. I couldn't unscrew the head from the body. So if I ever had to change the driver, that could become a nightmare. So I hope I never need to replace the LED though. The edges on the flashlight are rather sharp, not cutting sharp, but still unpleasantly sharp. It should help with the grip though. The knurling is done well and a bit rough, meaning the edges are a bit sharp. Again, this could be a Pro in some situations where you want the maximum grip! And on one side I think that is a good decision. The prints on the MG25GTS are also crisp and clear, no complaints there either. I can only check the threads near the tailcap. These threads are bare, with lots of lube. When the battery is inserted the tailcap needs to be pushed down quite a bit in order to catch the threads of the body. The reflector is probably made of aluminum and has a smooth finish. This means that the reflector has a tight beam that throws farther than an orange peel reflector where the beam tends to be wider and with a less obvious hot spot in the middle. The MH25GTS includes a strike-bezel that, according to their explanation, can break windows and help as a self-defense 'weapon'. 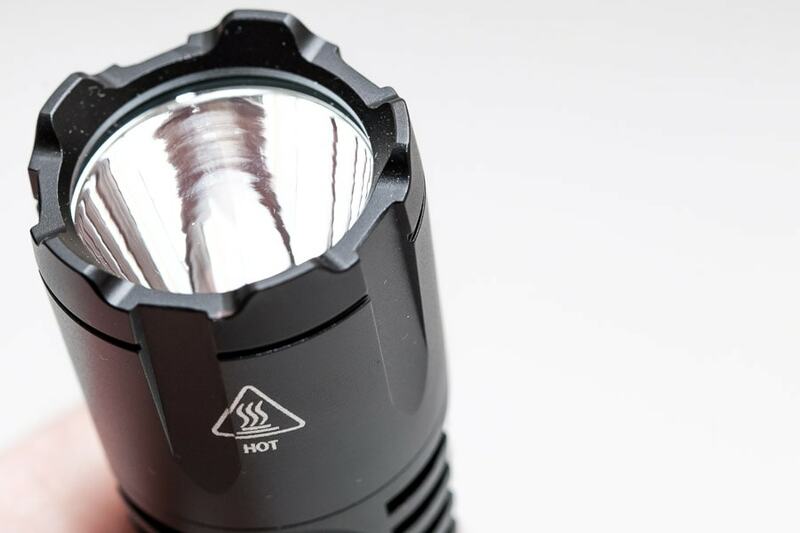 The Nitecore MH25GTS uses the CREE Xlamp XHP35 HD led. 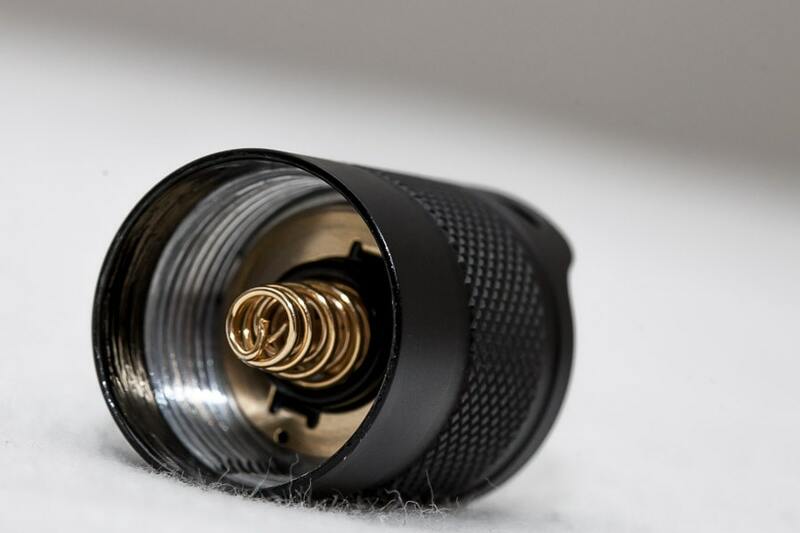 The XHP35 LED is a 12V LED but with the same size footprint as the XML and XPL LEDs. This HD led has a dome (that's probably where the D comes from). 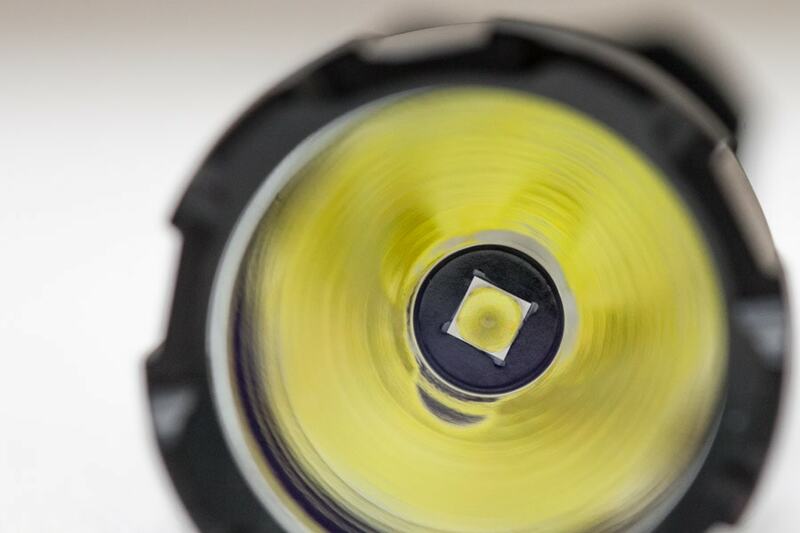 The HI version of this LED has no dome, but a flat silicon layer on top of the LED. HI probably stands for High Intensity. The one I received has a cold white emitter. Not my favorite! But I couldn't choose a tint when I ordered it. Below is a size comparison picture with the Jetbeam TH20, Astrolux FT01 and the Sunwayman V20C. 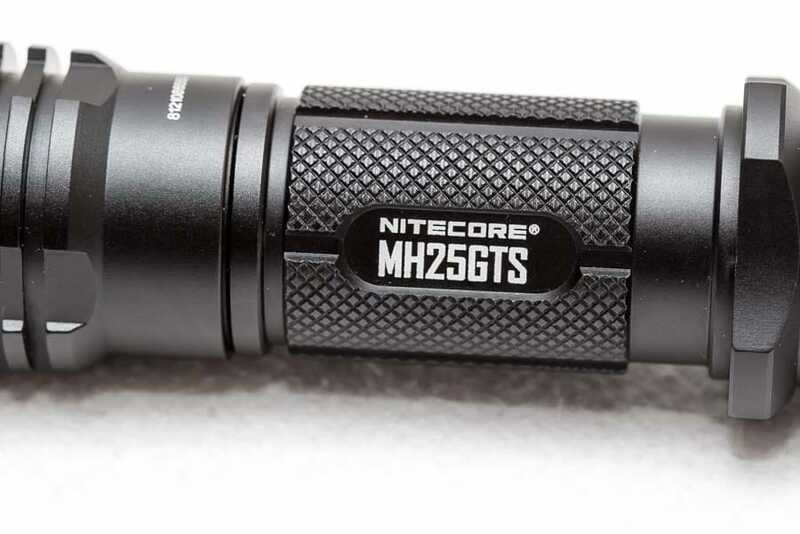 There are 2 types of switches on the Nitecore MH25GTS flashlight. The main switch at the tailcap, and 1 side switch for the mode changing. 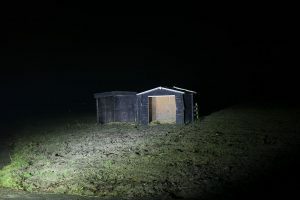 The main switch is used to turn the flashlight on and off, and the side switch is used to change modes. 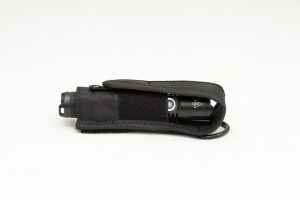 When you use it as a momentary on, you can change the modes, so the Momentary on works with all modes, including strobe. It's not really a Turbo, meaning that it is accessible by a double click or anything, it does however have the highest output. Check out the details below. Tip: when you press and hold the side switch +click the tail switch, the light will be in ultra low mode. If you press the main switch you can use it as momentary-on. This means that you can use signals such as Morse coding. The output of this setting depends on the last used mode (mode memory). So if he was in turbo, then the momentary-on will be the same as turbo, including strobe! Not SOS or Beacon! Yes. This setting is also used when using the momentary on setting. (half press when turned off). No, and it's not necessary, because of the mechanical tail switch! Not that I could detect. See picture below. Nitecore included a 3500mAh button top battery (protected!). It's a NL1835HP 3500mAh 8A. Which means it should be able to deliver 8A continuously. Unfortunately I can't test that. Flat top batteries will work as well, because on both side it has a spring. 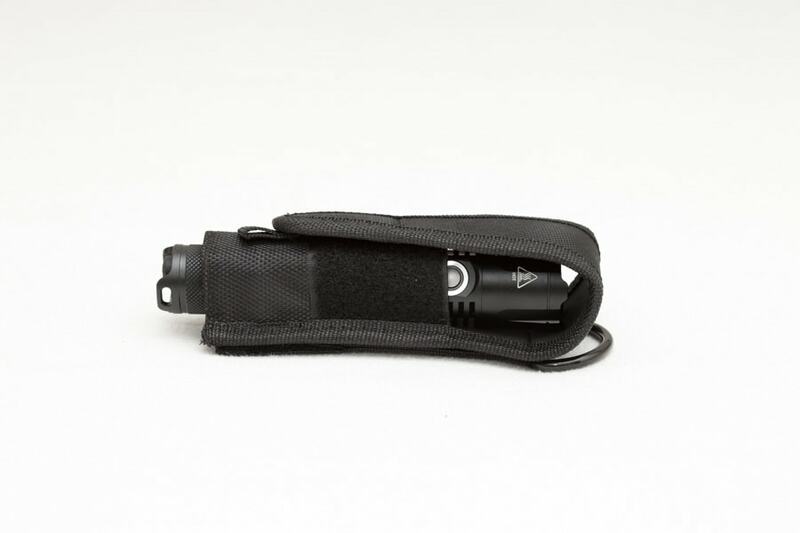 The included USB cable lets you charge the battery within the flashlight, so you don't need to buy a separate charger. This could definitely be a PRO when you gift it to someone. The port is a micro-usb port. 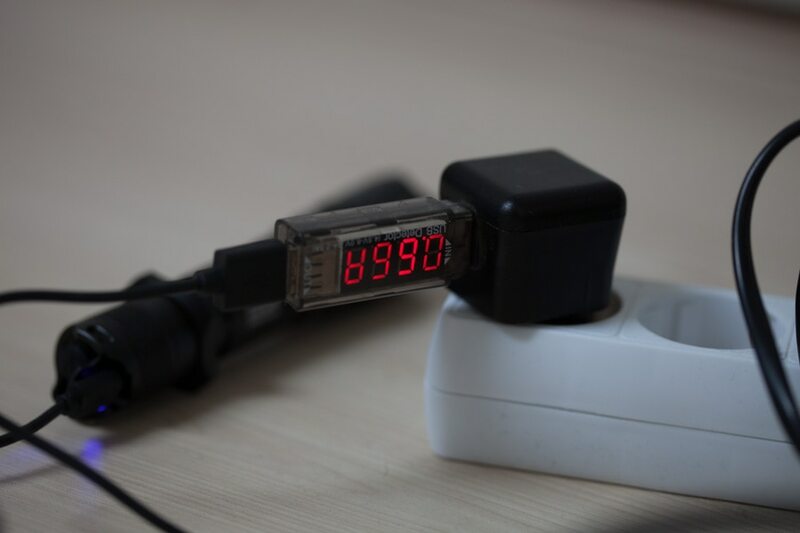 And according to my little XTAR usb voltage meter it charges at 0.6 Amps, which means it would take 6 hours to fully charge a depleted Nitecore NL1835HP (included) battery. The specs however say it takes 8 hours to charge, so I guess it will reduce the charge current towards the end of the charge. 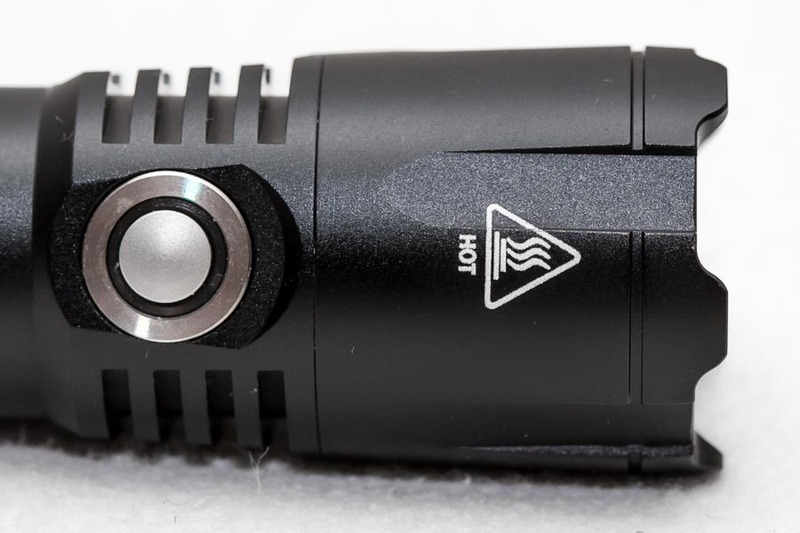 When you insert a battery and screw back the tailcap, the side switch will flash to indicated the Voltage. It will flash a few times for the single Volts, a short break, and then flashes again for the tenths so if it blinks 4 times... a break and then 1 blink, it's 4.1 Volts. When the battery is at low Voltage the side switch will show a continuous quick flash. 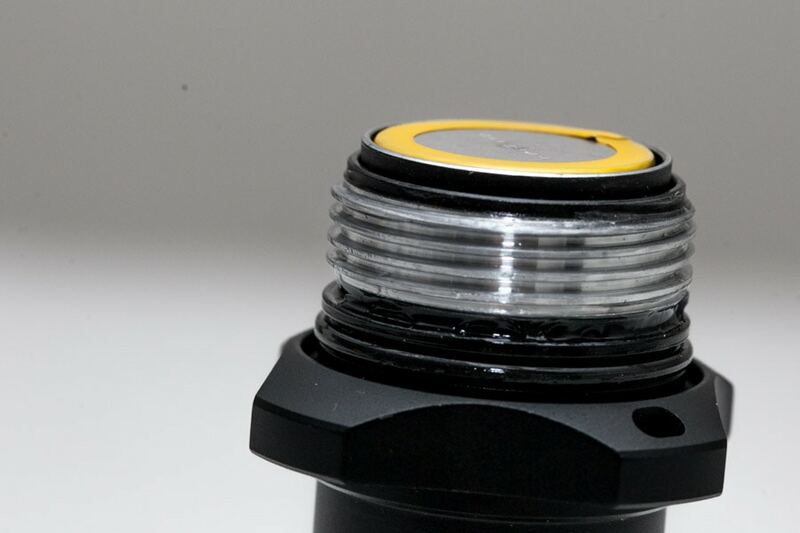 The Nitecore MH25GTS does not have any parasitic drain due to the mechanical rear switch! I couldn't get any readings on the tailcap. I dont really know why. Also since the head is glued, it's impossible to measure the Amps at the LED. For this runtime test I used the app Ceiling Bounce for it, which was made by a BLF member to measure throw, ceiling bounce and runtime.. Great little app for Android! After the runtime test the battery was 3.07 Volts (10 seconds after taking it out of the flashlight). Below runtime graph was taken with a Panasonic NCR18650B 3400mAh (unprotected) battery. After exactly 3 minutes the light starts dropping its output to about 700 lumens till it runs out of juice after 113 minutes. Which is close to 2 hours of runtime out of 1 battery. 1669 lumens is quite impressive for this size of light. Although the claimed 1800 couldn't be reached. 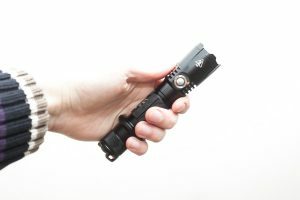 The Nitecore MH25GTS has a rather small diameter reflector, so it is never going to awe anybody concerning its 'throw' capabilities. For the throw measurement I used the SkyTronic LX101 lux meter. The battery I used was the Nitecore 3500mAh NL1835HP, which was included in the package when I bought it. 29000cd is still more than the manufacturer claimed at 23000. Camera settings: Canon EOS 5D markII 50mm, ISO 1600, F4, 1/4 second shutter speed, 5000K. The lumens written below the pictures are my measured Lumens and not the claimed Lumens! It's pretty hard to give a low score to such a great light. 1 thing that you have to keep in mind is that I don't use most of my lights that often. When I notice any negative points I tell them in the Cons section. But the MH25GTS is a good performer, but a little on the expensive side.